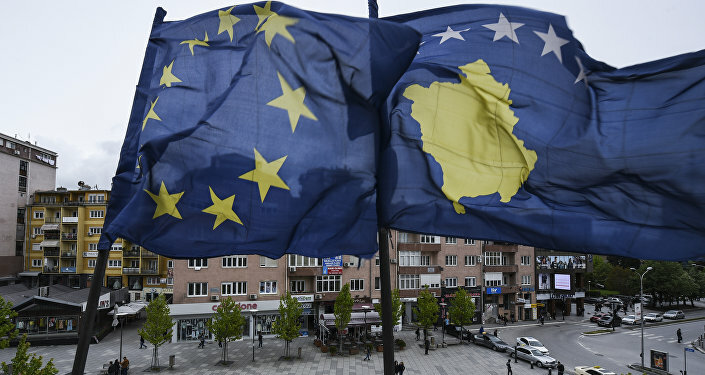 Kosovo's government approved a draft legislation aimed to extend the European Union Rule of Law Mission (EULEX) after its mandate expires next week, the media report on Friday. MOSCOW (Sputnik) — According to the Balkan Insight, at a meeting in the early hours on Friday the Kosovo government approved the draft legislation and called on the parliament to vote on it as soon as possible. EULEX was established in Kosovo in 2008 and its mandate expires on June 14. The Kosovo parliament is expected to vote on the proposed two-year extension in the next five days. EULEX mission in Kosovo focuses on providing support to Kosovo’s rule of law institutions until the progress of local authorities allows complete transition of executive functions to local authorities and aims to restore the rule of law throughout the north of Kosovo with predominately Serbian population. In 2008, the Albanian government of Kosovo unilaterally declared independence from Serbia. Since then it has been recognized as a sovereign state by over a hundred UN member states, including 23 out of 28 states of the European Union.